Al Rosen played football at the University of Miami in 1943. Following service for his country in World War 2, Rosen returned to Miami to finish his B.B.A. degree in 1948, but never actually played baseball at Miami. He went on to Major League Baseball and won the 1953 American League's Most Valuable Player Award and led the Cleveland Indians to the World Series. Al was on base when Willie Mays made his miraculous catch on Vic Wertz' long fly ball to deep center in cavernous Memorial Stadium. 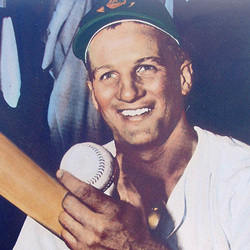 As an alumnus, Al was inducted into the UM Sports Hall of Fame in 1971 in our baseball category for bringing recognition to the university as UM's Greatest Professional Baseball player to that time. He passed away on Friday, March 13, 2015 at the age of 91.